Sport is a proven and efficient vehicle for building and connecting communities. Sport plays an invaluable role in unifying people with a common passion. Nationalism and sports are often intertwined and sport is also a powerful instrument for diplomacy and business development. Professional management of sports is, therefore, an effective tool for society building and national progress. 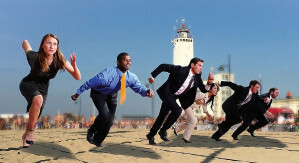 International Sports Management Academy (ISMA), with its head office in Noordwijk, the Netherlands, offers an international platform for management of sports, executive programs, masterclasses and conferences with the aim to share knowledge and experience in management, operational structures and grassroots sports development. The jewel on the crown of the ISMA-programs is the five-days Executive Program Sports Management, the Dutch way. The Action Learning Project is an important additional component based on a real life case in the participant's organisation. During the execution of the project ISMA will provide (distance) coaching to the individual participants. ISMA has developed a range of masterclasses, conferences and events regarding grassroots sports development, sports infrastructure, innovations in sports, marketing of sports and organization models. Check the programs button for upcoming events. Governments, Sports Authorities or Universities who are willing to offer the ISMA programs locally are invited to contact us. ISMA supports governments, sports organizations and sports related companies in their (strategic) sports development related issues. Next we can supply speakers, lecturers, (former) international sporters and scientists to support your grassroots sports development or to moderate at your events. The ISMA council and team of lecturers consist of experts and expertise in almost every area of grassroots sports development. Het succes van het Nationaal Sport Forum 2017 vraagt om een vervolg. Sport en politiek hebben vele raakvlakken. Hoe werkt de politiek? Doping en andere vormen van vals spelen, gokken op en beinvloeden van wedstrijden, Meespelen in een team waarin je niet gerechtigd bent.... Sport en ethiek hebben vele raakvlakken. Discussieer mee. Hoe scheidt je als bestuurder ratio van emotie? Olympisch schaatser en NOS-spotcommentator Martin Hersman vraagt zich met de deelnemers af hoe als bestuurder ratio van emotie te scheiden. Coporate identity is “hetgeen” dat uw sportvereniging of organisatie verbindt met de omgeving en stakeholders. Het is ook hetgeen dat zorgt voor een blijvende (zich aan de tijd aanpassende) verbinding met stakeholders zoals sporters, vrijwilligers, bestuurders, sponsoren, overheden, etc. Are you playing to win or not to lose? Every business is a service business. Does your service put a smile on the customers face?